Until now, many scientists and environmentalists have proclaimed about the importance of protecting environments around us, however, the awareness and implementation of it is still low, especially, on young adults and university students who are the leaders of future generations, possessing knowledge, expertise, and acting power. In reality, the volunteer rates of young adults turned out to be lowest in comparison to other age groups according to the U.S. Department of Labor. 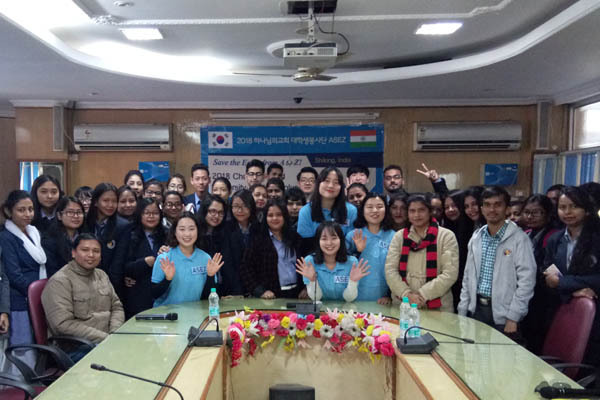 On January 19, 2018, the students from the various universities which are in South Korea and north-east India gathered the conference room in USTM to hold an environmental seminar. This seminar was held to raise awareness of university students about the magnitude of environmental problems and to achieve SDGs, Sustainable Development Goals, which was adopted by United Nations in 2013. The seminar which was conducted by ASEZ (Save the Earth A to Z), university students volunteer group consists of the member of World Mission Society Church of God, proceeded the event according to the following sequences: Choir, ASEZ Introduction, PPT presentation about environmental problems and Introduction of Mother’s Street Project. The Motto of ASEZ has properly matched to achieve UN SDGs founded on the goal, ‘No one is left behind’. UN SDGs which consists of 17 goals has pursued the needs to have the altruistic sense of morality for others’ lives, not just seeking benefits of our own. To achieve SDGs, the role of university students, possessing knowledge and acting power, has been emphasized day by day because they are the future of our planet.